Along the south shore of the Old Plantation Creek inlet where it converges with the Chesapeake Bay close to what is now the quaint little town of Cape Charles, Arlington Plantation was founded on the Eastern Shore Virginia. This special site is one of the most historic properties in our nation yet its significance is little known. For many centuries this area was inhabited by native American Indians, until occupation by English settlers of this site and the area up to the Kings Creek inlet three miles north, Sir Thomas Dale established the first permanent settlement of English colonists on the Eastern Shore in 1617 known as Dale’s Gift. Here, half a century later, a plantation was founded by John Custis II whose prosperity was demonstrated by the construction of the most magnificent mansion on the whole of the Chesapeake Bay. Apparently he named the plantation in honor of his family’s benefactor, Lord Arlington, although the name was possibly derived from the English village Arlington-Bibury, home to the first generation of the Custis family. More than three hundred fifty years after Arlington mansion first rose high above the waters of Old Plantation Creek, the name itself still lives on, engrained in the minds of all Americans as the land upon which thousands of American soldiers rest eternally, Arlington National Cemetary. National recognition of the Custis name began when, in 1759, the widow of John Custis IV’s son Daniel, Martha Dandridge Custis and the heir to Arlington Plantation, married army Colonel George Washington when he was only twenty-six years old. As was the custom of the times, on his way to becoming the father of our country, Washington managed the affairs of his wife’s property here on the Eastern Shore. And in the paradoxical twists and turns of history, Martha’s great-granddaughter, Mary A. R. Custis to whom both Arlington estates passed, married another young Army officer, who would become, like George Washington, an icon of the American story. It is indeed ironic that Robert E. Lee would take reluctant command of the Confederacy’s Army of Northern Virginia which strived to split the nation that was hardwon by his wife’s legendary ancestor, its first President. And so the prestigeous Custis family, which founded Arlington Plantation on the Eastern Shore and Arlington Plantation on the Potomac River, links George Washington, the Revolutionary War and the founding of our nation with Robert E. Lee, the Civil War and the near destruction of the nation. The name of the Custis family ancestral plantation, Arlington, lives on today in the American consciousness despite the destruction of its mansion more than two-hundred fifty years ago. In the early part of the nineteenth century, Martha’s grandson George Washington Parke Custis, who was adopted by General Washington and his wife as their son, built a mansion near Mt. Vernon overlooking the Potomac River. He called it “Arlington” after the first Custis home on the Eastern Shore of Virginia and the vast lands surrounding his mansion became the National Cemetary after the Civil War. The Arlington mansion on the Eastern Shore was abandoned sometime during the early part of the 18th century. Its ruins were pilaged and what was left eventually became buried in the farm fields surrounding its site, the only evidence of its grandeur that remained were the prominent tombs of John Custis II and his grandson, John Custis IV. Such a large home, built of brick masonry, required laborers and materials and facilities for making the bricks. It is believed that the kilns for firing the newly made bricks are located 3/8 mile south of the ruins on a 15 acre tract of land that contains a modern two bedroom home and barn with horse stable. Behind the home, hidden in the forest and covered with the detritus of fallen leaves, vines and dirt are piles of old and crumbling bricks. That site is at the head of a shallow tidal pond that probably provided the water necessary for mixing the brick clay. This property is one of several now offered for sale by Blue Heron Realty Co. located on what were the original Arlington Plantation lands. 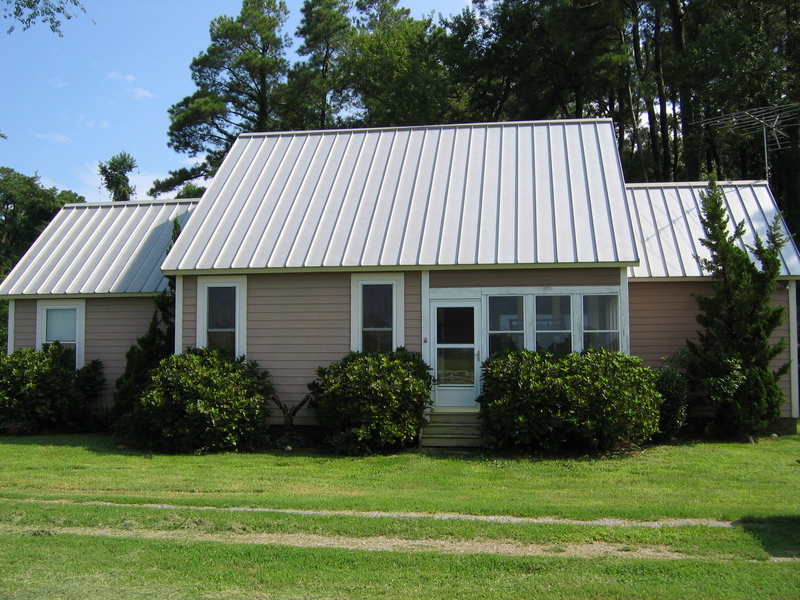 This house on 15 acres was built in 1999 and offers ultimate seclusion, peace and quiet with a location only 1/2 mile from the Chesapeake Bay and its sparkling sand beaches. With its vaulted ceiling over the great room and kitchen, an easy living lifestyle goes perfectly along with its private rural setting. Originally planned as a complimentary guest cottage for a larger manor home on the property, this cute cottage has a very spacious master bedroom with ensuite bath and walk-in closet and a guest bedroom with full bath. The enclosed porch overlooks the 2 acre fenced horse paddock and barn. The paddock is encircled with an underground electric dog fence and behind the barn is a four unti professional quality dog kennel. 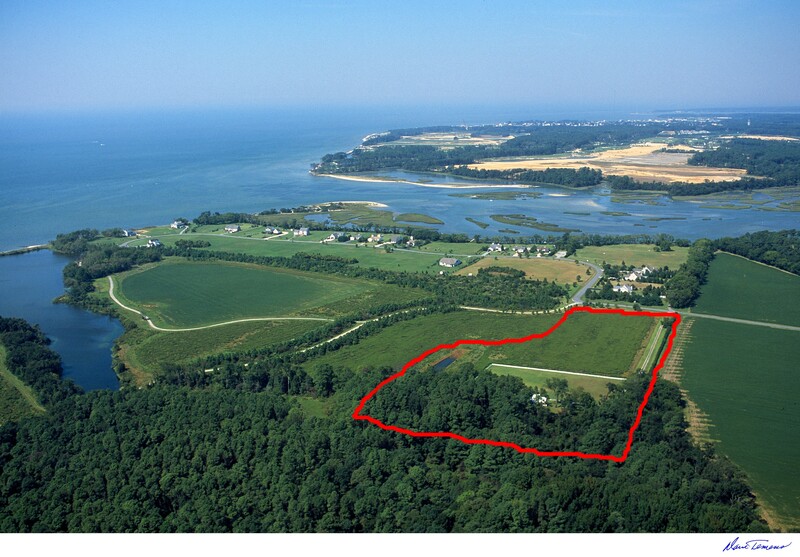 See redlined property in aerial photo at top of page. 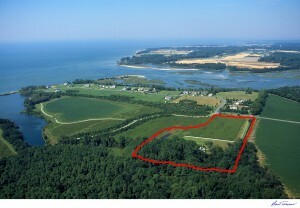 Also available for purchase is a beautiful Bayfront lot with 100′ of frontage on the Chesapeake Bay with a sandy beach shoreline and spectacular sunset views to the west. 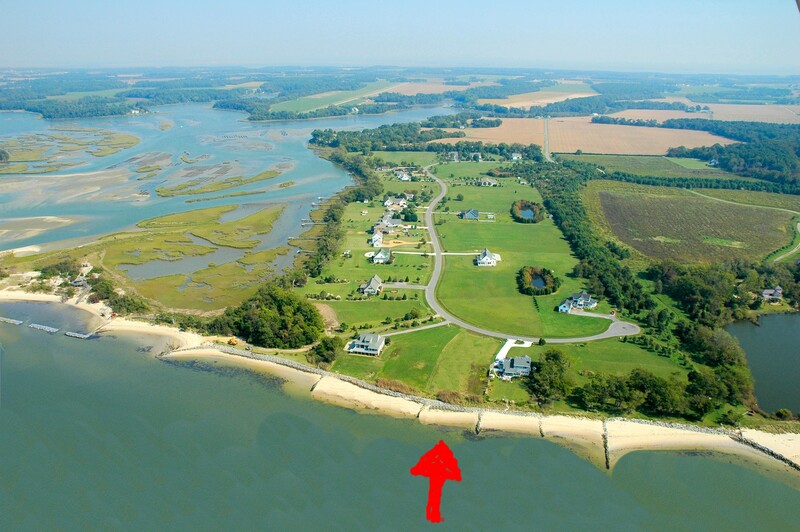 Purchase of this lot offers membership in the Arlington Homeowners Association with benefits to use the boat ramp on Plantation Creek and the beautiful common area beach at the point of the entrance of the creek into the Chesapeake Bay, one of the best swimming spots on the Shore. See aerial photo with red arrow. Contact David Kabler (david_kabler@hotmail.com 757-647-1755) at Blue Heron’s Cape Charles office, 757-331-4885, for further information and an appointment to see these two special property offerings. Aqua’s Restaurant, located next to the Bay Creek Marina. Overlooking the Chesapeake Bay with gorgeous waterviews, very romantic indeed. Starting Friday February 10th through February 14th, Aqua is offering a special Valentine menu which includes a shared appetizer, soup or salad, an entree and a shared dessert priced at $65.00 per couple. Lots of choices including Steak Dianne and a vegetarian entree. For reservations call 757-331-8660. The historic Eastville Inn, a lovely building which dates back to the early 1770’s, will be re-opening on February 8th. For Valentine’s, the Inn will be offering a special menu including Surf and Turf with appetizer, salad, entree and dessert for $59.95 per couple. Call for details and reservations at 757-678-5270. The Charlotte Hotel– As usual, an Oh so very cleverly designed menu with lots of delicious choices including an appetizer of heirloom cheddar tartlett with sweet pepper escabeche, a wild mushroom stuffed breast of chicken with gorgonzola and red wine risotto and a warm cherry tart with almond ice cream, all items priced a la carte. For reservations call 757-787-7400. www.thecharlottehotel.com – their Valentine menu can be viewed on-line. Planning to cook for your honey at home ? Haven’t decided on a menu yet, maybe use a little help, a few suggestions ? Click on www.splendidtable.publicradio.org on Sunday, Feb 12th and they will have their Valentine menu and recipes ready to download. Splendid Table, heard here locally at noon on Sundays on NPR, bills itself as ” the show for people who love to eat “, which pretty much describes everyone in my family, including moi. Not only does Splendid Table feature great interviews with a wide and diverse variety of folks involved with food, including chefs, farmers, vintners, cookbook authors, etc., etc., it also offers wonderful recipes and suggestions for jazzing up old recipes, on-air and on the website. Last year I cooked their Valentine entree — Feast for Lovers– roasted pork tenderloin with black olives and orange. It was scrumptious and my husband also loved the leftover pork sliced for a sandwich the next day. If you’re cooking but don’t want to bake, call the Corner Bakery, 757-757-4820. They are featuring a melt-in-your-mouth heart-shaped cake for 2 and also giant chocolate covered strawberries. Yellow Duck Bakery Cafe’ , 757-442-5909 also has wonderful sweets for your Valentine sweetie as does Kate’s Kupboard 757-442-7437, Kate’s is also home to some totally awesome dinner rolls. So make your reservation, grab your Honey by the hand, say “I’ve got you, Babe” and have a wonderful, wonderful Eastern Shore Valentine’s dinner. You are currently browsing the Life and Real Estate on the Eastern Shore of Virginia blog archives for February, 2012.